Thanks Shelly! 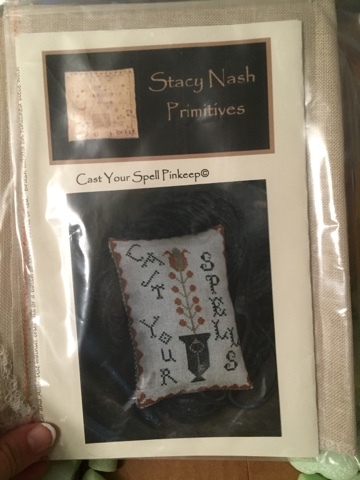 I was the lucky winner of a giveaway over at Arizona Stitcher and I received it last night. It was far beyond my expectations and I love it all! 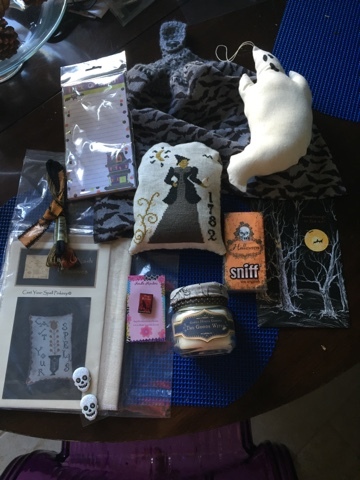 I got a cool kitchen towel, ghost and witch decorations, a candle, some Halloween tissues, skull earrings, some cool skull stickers which I might make into needleminders, a cool Halloween biteand some stitchy stuff including a kit for a pin keep which I is great since I don't have one yet, a needleminders of the Raven which is one of my favorite Edgar Allen Poe story, some Halloween colors of DMC and a great card to round it all out! On another note I have 2 job interviews set up on Friday so I'm crossing my fingers and toes! The first one is the one I would love because it's at the superintendents office as a clerical worker and it pays well. I already did the intake exam which narrowed the field from around 40 candidates to 10. I think there are 2 interviews for that position. The second interview is at a school as a student advisor. It's temporary but might turn into permanent. I have no idea how long the position is for though. But I'd be thrilled with either of them! I'm really excited but really nervous too. At least I know the candidate pool of the first one. I've made good progress on Paradise too but I'll save that for a little later. Wish me luck and thanks a ton Shelly! Awesome!!! Congratulations on a spooktacular win! You're welcome Heather. 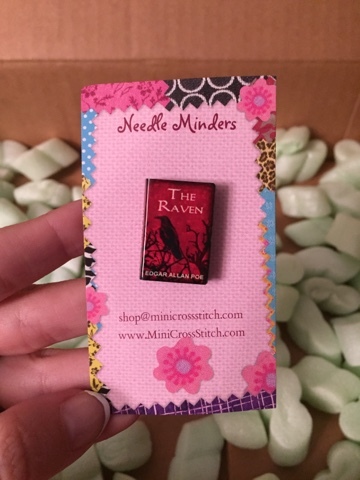 I would've never known the Raven is a favorite of yours! Glad you like it all. Good luck with your interviews! What a wonderful parcel of goodies from Shelly! I love the pillow she made and the cute ghost too. Good luck for your interviews. 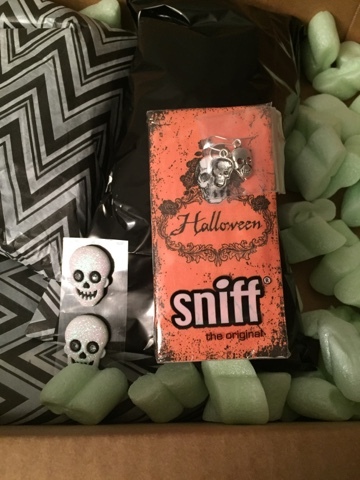 What a great prize from Shelly, just gorgeous Halloweeny gifts. Good luck with your job interviews. I am sure that you will get one of them. Good luck with the job interviews!! Awesome prize! Fingers crossed on the job front for you. 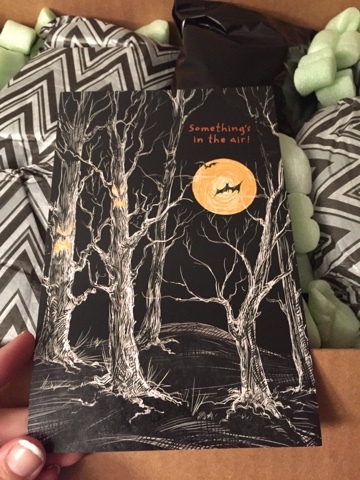 Wow, those are some gorgeous things! 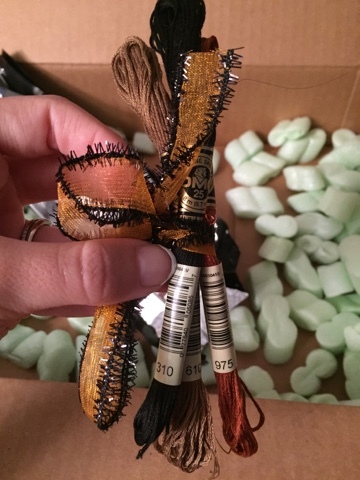 I especially like the metallic threads:) I hope your interviews go well and that you can land one of the jobs:) We always need more money so we can get more stash, right?! Good Luck! Wow wonderful RAK! Lots of great things. Huge Good luck on your interviews! What an awesome win! Lots of good stuff :) Hope your interviews went well and you get the perfect job for you! Oh my, your little package from Shelly is just awesome. Such great goodies, enjoy them all. I hope everything went well with the job interviews. 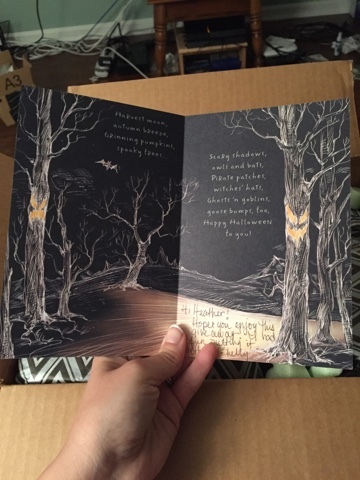 October SFS and a Page Finish!